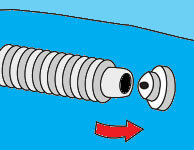 Attach vacuum hose and pole to vacuum head. 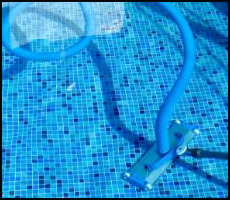 Submerge unit in pool. Hold other end of hose over water return. Hose will fill with water, driving out all air trapped in hose. 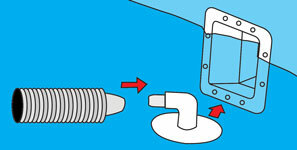 While holding hose below water, place the vacuum plate into the skimmer, leaving the leaf basket in place. Quickly attach hose to elbow fitting*. You are now ready to vacuum. *Note: If your skimmer was not supplied with an elbow fitting, simply take off the skimmer cover and put the vacuum hose directly on to the vacuum plate.